Who Lost the Most in the Financial Crisis? Ordinary Americans. Bloomberg Opinion marks the 10th anniversary of Lehman’s bankruptcy with a collection of columns from around the world. Read more. A decade after the collapse of Lehman Brothers Holdings Inc., there are still arguments about who was responsible for the 2008 financial crisis. But it’s also worth revisiting who paid for the crisis and who profited from it. Any discussion about winners and losers, of course, must start with the bank bailouts. The centerpiece of that rescue was the Troubled Asset Relief Program, or TARP, an October 2008 federal law that authorized the U.S. government to “invest” in banks and their toxic mortgage-related assets. The U.S. Treasury invested $426 billion and ultimately recovered $441 billion when TARP ended in December 2014. While it’s true that TARP turned a profit, the reward was laughably inadequate for the risk. The program bought assets that were deeply distressed — assets that ought to pay above-market returns when prices recover. Instead, TARP generated a return of less than 1 percent a year from October 2008 to 2014, while the S&P 500 Financials Index returned 5.3 percent and the S&P 500 Index returned 12 percent, including dividends. The difference amounts to hundreds of billions of dollars. The Federal Reserve threw banks a lifeline, too, by holding interest rates near zero for years. The average effective federal funds rate dropped to 0.16 percent in December 2008 and remained below 0.25 percent through the end of 2015. That allowed banks to borrow money cheaply. It also sapped savers of badly needed income. Those moves were undoubtedly necessary to keep the financial system and the larger economy from collapsing. But banks bore too little of the burden, and it’s difficult to view the bailouts as anything other than a massive wealth transfer from ordinary Americans to financial firms. But there was another — arguably bigger — wealth transfer during the financial crisis between ordinary investors and more sophisticated ones. 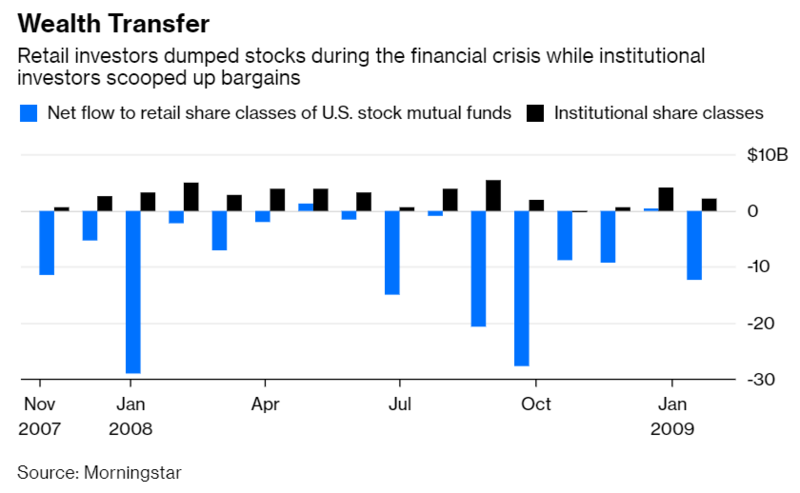 As the stock market tumbled from November 2007 to February 2009, retail investors pulled a net $152 billion from U.S. stock mutual funds, according to data compiled by Morningstar, including adviser and retirement share classes. More than half of those redemptions, or $78 billion, were during the market’s lowest points from September 2008 to February 2009. Institutional investors, on the other hand, scooped up the bargains. They poured $43 billion into institutional share classes over those 16 months. And remarkably, they yanked money during only one month in that period, a $278 million outflow in November 2008. It was the same with international stocks. Retail investors pulled $56 billion from international stock mutual funds during the period, while institutional investors added $2.6 billion. 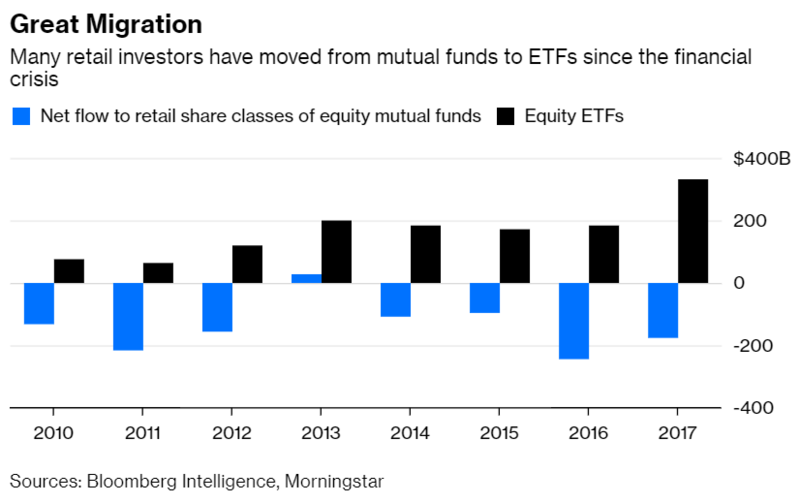 Granted, some of that selling may have been a result of retail investors migrating from high-cost mutual funds to low-cost exchange-traded funds, but that explanation isn’t entirely satisfying. For one thing, the inflows to stock ETFs during the period were a fraction of the outflows from mutual funds. It’s also hard to know whether the investors selling mutual funds were those buying ETFs. The more likely explanations are that retail investors were in financial distress and forced to sell at depressed prices, or they were overwhelmed by fears of a financial collapse and couldn’t hang on. Either way, their losses would soon turn into big gains for institutional investors. The trend has continued. Retail investors have pulled money from U.S. stock mutual funds every year since the financial crisis, including during the 10 months from March to December 2009 and this year through July — a breathtaking total outflow of $1.2 trillion. Meanwhile, institutional investors kept buying every year, a total of $469 billion. The same has been true for international stock mutual funds, as retail investors have yanked $14 billion and institutional investors have added $564 billion. Many of those retail investors have most likely moved to ETFs since the crisis; stock ETFs have taken in $1.4 trillion since 2010 through August. On the other hand, there are also indications that many retail investors have stayed out of the market. Still, there are reasons to be hopeful that retail investors will fare better during the next crisis. 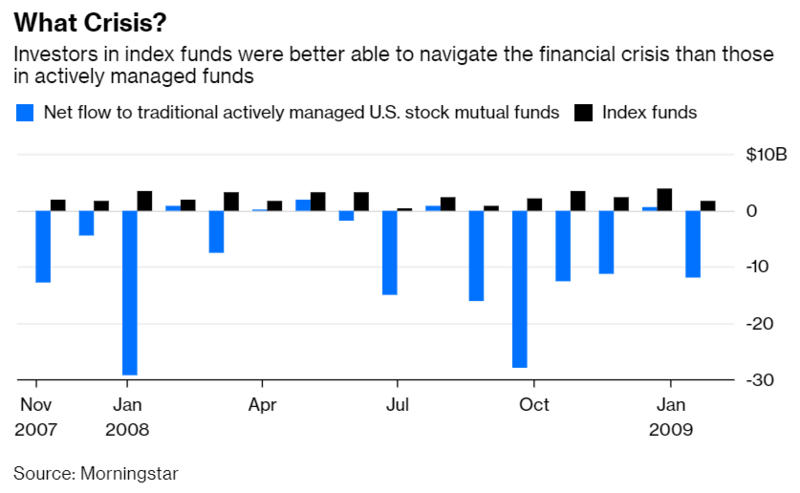 More of them are turning to index funds, where there’s evidence that investors were better able to navigate the financial crisis. Traditional actively managed U.S. stock mutual funds experienced outflows of $146 billion from November 2007 to February 2009, while index mutual funds had inflows of $38 billion. International stock mutual funds experienced similar flows, with $70 billion flowing out of actively managed funds and $17 billion flowing into index funds. Ten years after the collapse of Lehman, what is clear is that a lot of money left the pockets of ordinary Americans. 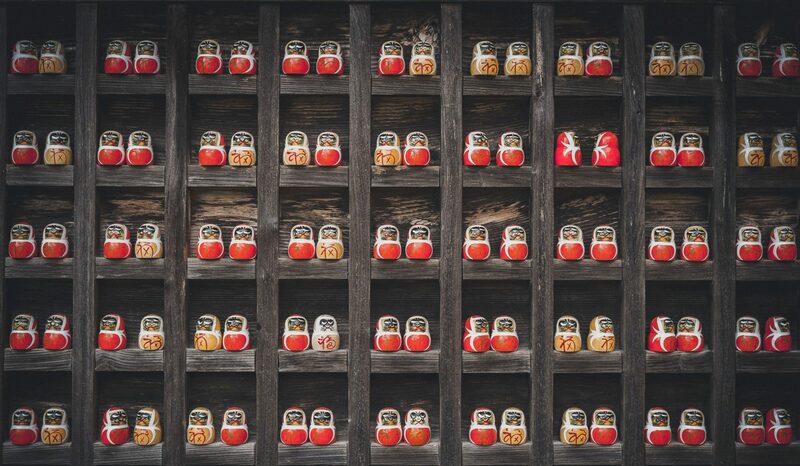 While there’s no telling where the next crisis will come from, the lesson from the last one is that retail investors need to be better prepared to keep their pockets from being picked by more sophisticated players. Nir Kaissar is a Bloomberg Opinion columnist (formerly Gadfly) writing about markets and investing. He is the founder of Unison Advisors, an asset management firm. He has worked as a lawyer at Sullivan & Cromwell and a consultant at Ernst & Young. For media or speaking inquiries, nkaissar1@bloomberg.net. If Hedge Funds Are Lagging, Why Do They Have So Much Money? Bill Gross Misfired at Janus. But He Had the Right Idea.